Ahhh, thanks - I see I missed out Alania's entry too - so I've corrected this mistake now... Thanks for letting me know, and for being so honest - I hope you have good luck! You can check your numbers here! Congratulations to our three winners - and thank you to everyone who entered! If you didn't win, and you want to watch you have two options. 1. If you're quick, you can get a discounted pass here - limited supply! Streaming starts very late TONIGHT!!! OMG Mikhail - Did you see what happened?????? Your SECOND entry won, but I had missed out Alania, and had already corrected this mistake! Sorry my friend!!!! iddqd and Alania - please check your private messages (PMs) as I have sent your log in details and password for your prize! Last nights match was 8 Ball on a 10 Foot Table, each match is a race to 17. Tonight's match will be 9 Ball on a 10 Foot Table. Thursday's discipline will be 10 Ball - on the same 10 Foot Table. heh, that's pretty cool. Nevertheless, I'm stunned to see two of three winners picked by Euromillions are from Russia, especially taking into account there have been none in previous draws. 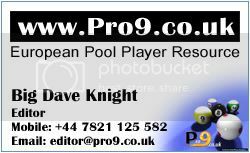 Thanks for the chance Dave and Pro9.UK! Да ладно!!! Я чего нажил трансляцию фри?!! Опрачки! Ураа! Мишаня, капец, а как мне посмотреть - то теперь?! Come on! I'm the winner! Tonight's match is 9 Ball - streaming starts 3 hours from now! alania писал(а): а как мне посмотреть - то теперь?! я думал, Дэйв в личку должен был написать, логин там да пароль какой-нибудь для доступа к PPV. Первый день ты пропустил, но там были глобальные проблемы с доступом у всех, поэтому считай пропустил вместе со всеми. Если тебе никаких уведомлений не поступало, сам ему пиши в ЛС. 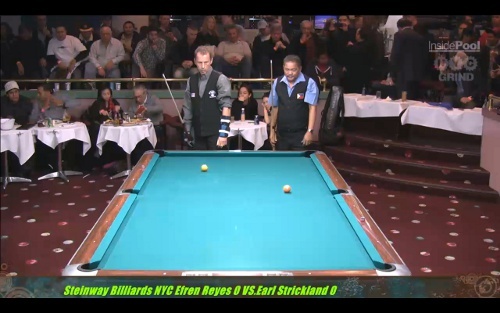 Earl took the 9-Ball with a final winning score of 18-16 over Efren. Can Efren salvage something and win the 10-Ball tonight?